Look at askapache. That's pretty boring huh? It would be cool to have a nerdy textual representation of that for extra nerdy stuff like styling my /robots.txt file, email list signatures, forum sigs, etc. But who has time to create that by hand? That was generated using my Online Figlet ASCII Generator. Just type in text and select the ascii font you want and there you go. Please try it and let me know what you think! 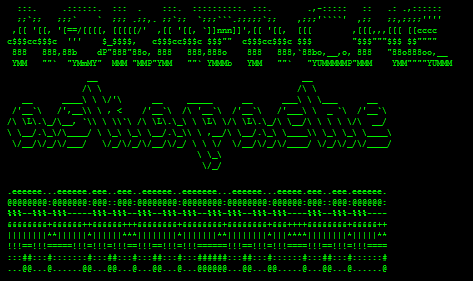 The output is ascii text, stylized with CSS! 88   88 db   8D 88 `88. 88   88 88      88   88 Y8b  d8 88   88 88. 8888b. .d8888b 888  888 8888b. 88888b. 8888b. .d8888b88888b. .d88b. 888  888     X88888 "88b888  888888 d88P888  888Y88b. 888  888Y8b. c$$$cc$$$c  '''    $_$$$$,   c$$$cc$$$c $$$""  c$$$cc$$$c $$$        "$$$"""$$$ $$""""
z`    ^%  < .z@8"`                                                        .uef^"
us888u.   .@^%8888"    888E u@8NL     us888u. %8888:u@88N     us888u. .udR88N   888E .z8k    ud8888.
.@88 "8888" x88:  `)8b. 888E`"88*"  . @88 "8888"   `888I  888. .@88 "8888" <888'888k  888E~?888L :888'8888. 9888  9888  8888N=*8888   888E .dN. 9888  9888     888I  888I 9888  9888  9888 'Y"   888E  888E d888 '88%"
9888  9888   %8"    R88   888E~8888   9888  9888     888I  888I 9888  9888  9888       888E  888E 8888.+"
.--. .--. : `'.' .--. .---. .--. .--. : `-. .--. .oPYo. .oPYo. 8  .o  .oPYo. .oPYo. .oPYo. .oPYo. 8oPYo. .oPYo. 8    8   'Yb. 8 `b. 8    8 8    8 8    8 8    . 8    8 8. .d8888b. .d8888b. 88  .dP  .d8888b. 88d888b. .d8888b. .d8888b. 88d888b. .d8888b. .d8888b. .d8888b. 88  .dP  .d8888b. 88d888b. .d8888b. .d8888b. 88d888b. .d8888b.